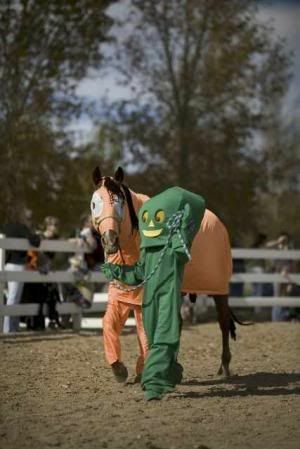 Above: Previous Halloween with Horses costume contest participants–Pokey & Gumby was a flash into the past! Photo courtesy of Colorado Horse Park in Parker, Colorado. 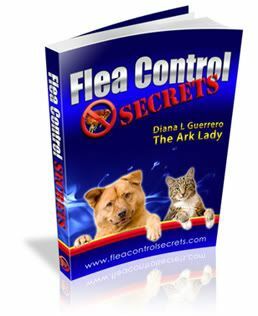 When I wrote, Blessing of the Animals: A Guide to Prayers & Ceremonies Celebrating Pets & Other Creatures (Sterling Publishing) I covered different pet ceremonies from the time an animal arrives into a home until he or she passes away. One of the fun sections is dedicated to pet parties–and since Halloween is around the corner I thought I would revisit Howl-o-Ween. Believe it or not, over 3.7 million dog owners will purchase gifts or costumes for pets specifically for Halloween festivities. Then there are unique celebrations that include pets and other animals. I was sad to hear that the popular Halloween with Horses, held in Colorado, will not take place in 2009. Normally the Colorado Horse Park offers a horse costume contest (with a $1,000 prize for best costume), safe trick-or-treat barn, pony and horse rides, the “Stable of Terror,” straw maze, pumpkin patch, face painting, petting zoo, horse entertainment, along with food and a fall fair. This was one of the few horse events I knew of and I hope they can resume again next year. TrendHunter shared some amazing photos of a Halloween Horse by Gillian Higgins who did some anatomy artwork (skeletal and muscular) as her project. Halloween with Horses 2005 was photographed by John West and you can see (and purchase) some of the photos online. By far, dog events are the most popular events and if you are in Southern California, the Haute Dog Howl’oween Parade in Belmont Shore may just be what you are looking for. Know about some unusual pet Halloween celebration? Share your info in the comments!